LIBYA’S coastguard picked up 443 African migrants on Thursday from three inflatable boats in trouble near its western coast. 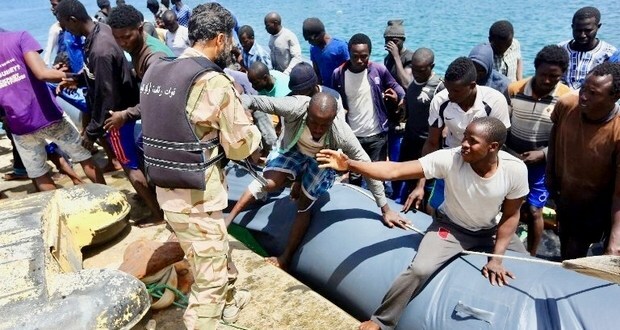 “The coastguard rescued 301 migrants early this morning, including three women and 46 children from 12 different sub-Saharan countries,” its spokesman Ayoub Qassem said. Qassem said the illegal migrants were on board two big rubber boats, adding that the engines of the two boats stopped working in the middle of sea. He said the coastguard had also recovered three bodies and rescued 142 illegal migrants 25 miles off Tripoli’s eastern Qarabulli town after their boat got torn in the middle of sea. Qassem said that two migrants were being treated in a hospital, he said.